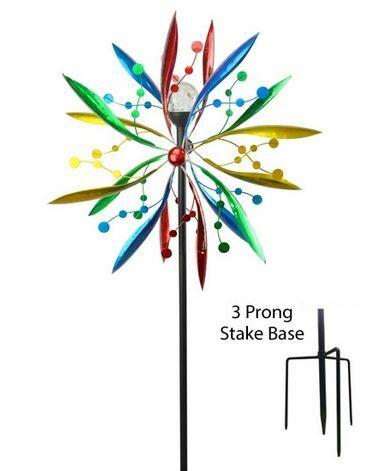 Super excited to get this new 84" Solar Windmill Wind Spinner on the site. W haven't had time to write out the description yet, but it is so Awesome! Flying Pig Planter | Winged Pig Bird Feeder | Welcome Pigs w/Solar Lantern | Silly Solar Welcome Frog w/Birds | 48" Triple Cosmic Kinetic Spinner - Purple | 48" Triple Cosmic Kinetic Spinner - Teal | Solar Garden Sign Marquee | Solar Metallic Flower Stake - Blue | Solar Metallic Flower Stake - Pink | Solar Flower Chime - Green | 84" Solar Windmill Wind Spinner | Dazzling Daisy Wind Chimes | 23" Gecko Wind Chime (Set of 2) | Solar Resin Pilar w/Glass Top | 28" Pastel Butterfly Wall Decor (Set of 6) | Hummingbird Spiral Suncatcher | Large Yellow Fairy Garden Stakes (Set of 2) | Elton Gnome Statue w/Piano Collectible | Bee & Ladybug Bird Feeder Combo! | 3 DOZEN Metal Butterfly Garden Picks! | 3 DOZEN Metal Dragonfly Garden Picks!